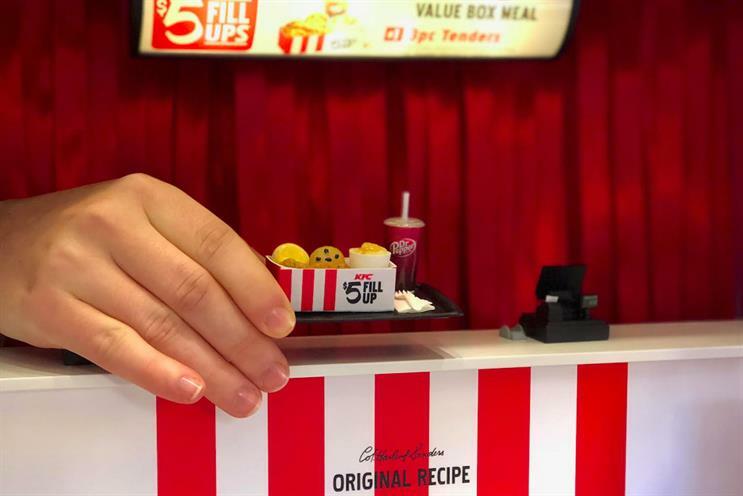 KFC is creating the world's smallest version of its restaurant in the US to tie in with the popular mini food videos online. Wieden & Kennedy Portland has created a video to show how its food is made in a very small kitchen and will be opening the space, which is 43 inches by 32 inches by 27.5 inches, tomorrow (16 December) in Portland. People will be greeted by a pair of "friendly" hands to take their order and deliver the cooked mini meal of three chicken pieces, mashed potato, Dr Pepper and a chocolate chip cookie. George Felix, director of advertising at KFC US, said: "We’re always considering new ways to use innovation and technology to do out of the box things that have become ‘on brand’ for us. "The mini foods video is a sharable way to show how our famous Original Recipe fried chicken is prepared the hard (…and mini) way. To bring it to life and make it authentic, we decided to open the world’s smallest KFC offering up a unique experience for fans."